Browsing: / Home / Cutting Trends in Desert Alfalfa to achieve 10 tons/ac. Are your fields producing 10 tons/ac per year of alfalfa hay? If not, the cutting data above may give you an hint as to why. 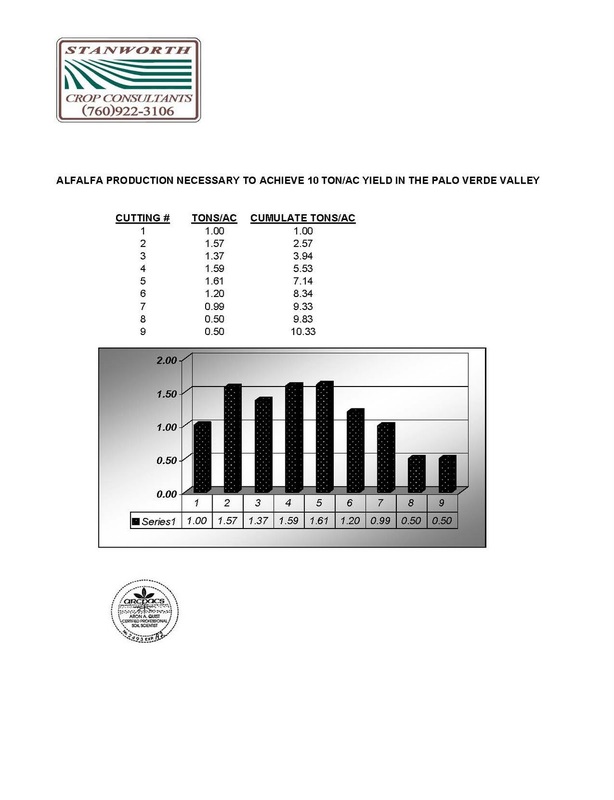 Many years of research here in the Palo Verde Valley, California on good producing alfalfa has shown us that good fields follow a yield trend through the season. Our highest yielding cutting generally is the 5th cutting (May-June) at 1.61 tons/ac. Yields diminish from there to the end of the season. It has been our experience that if the third cutting out yields the second cutting then the field may be on it’s way to 12-13 tons/ac for that year.